This show is filled with THIRTEEN wonderful listener contributions. From the sweet to the silly to the artistic to the snarky, they’re all fabulous. I tell you the story of how we ended up with 200 Volts AC in our house and what that does to unprotected devices (spoiler, it’s a BAD thing). In Chit Chat Across the Pond, Bart gives us the first half of his IP Subnet explanation in Taming the Terminal part 25 of n, where he unravels the mystery of subnet masks. Hi this is Allison Sheridan of the NosillaCast Mac Podcast, hosted at Podfeet.com, a technology geek podcast with an EVER so slight Macintosh bias. Today is Sunday December 7, 2014 and this is show number 500! I have to say I am overwhelmed at the recordings you guys sent in! Some are funny, some are heartwarming, some are crazy, some are incredibly creative – basically a perfect cross section of the NosillaCastaways. I’m going to sprinkle the listener contributions throughout the show, probably a few at a time. If you’re new to the show, note that this show is not very representative of a “normal” show! It will be fun but not normal. Let’s start out with a contribution from Steve Davidson followed by one of the most notorious characters on the show. Hello Allison, dis is your old friend, Professor Albert, and I just want to congratulate you on 500 episodes of the very best podcast in the vurld, Da Nosillacast, and because of dis, I have written you a new theme song and I am going to sing it and perform it for you today, and for now on, you need to use it for your podcast! Excuse me, I have to varm up… MEEE, MEEE, MEEE, MEE, MEE, MEEE, MEEEE! Dis is Professor Albert GETTING DOWN vith da HIP HOP BEAT!! as she talks with Bart from across the Pond. and she even gets Steve to talk video! Only you, professor, only you! I’m not sure the listeners are quite ready for your new theme song but perhaps I’ll save it for April fool’s day? George from Tulsa sent us a REALLY cool book to celebrate the 500th. It’s a giant, hard-cover coffee table book called iConic. It’s a photographic tour of the history of Apple. It is absolutely gorgeous, a perfect coffee table book for the geek! I put a link to it in the shownotes over on Amazon so you can point your family right to it to buy it for you! George, you rock. Thank you so much Kirschen and Barry! By the way, Barry is NOT kidding about inviting all of us out to Chicago for a Mac barbecue. I talked to him this week about it and he’s going to advertise this on a bunch of Mac shows to make sure we get a good showing. I think it’s ironic because Barry is notorious for simply showing up places, like Liverpool, and my front yard, so it’s about time we went to him! I put a link in the shownotes to http://midwestmacbbq.com/. G’day, Allison! It’s Doug Ingram from Sydney, Australia, wishing you a big “congratulations” on NosillaCast number 500! Five hundred shows. What a milestone (or a 1.6 kilometre-stone for us Metric people)! From listening to around 400 episodes of the NosillaCast there are so many things that I’ve had you clarify for me even when you didn’t know I needed to know them. I’m using software that you’ve recommended over the years that has helped me be more productive and more knowledgeable in my job as a tech support provider. My clients sometimes thank me for creating tutorials that help to clarify the steps to solving their problems. When they thank me I always mention to them that I use an application recommended on a podcast that I listen to. You know, that application that helps you to clarify things, so that people aren’t confused by technical explanations. I can’t remember what it’s called but you know the one I mean, from the Blue Mango guys. It’s embarrassing that I can’t clarify this more. Man, turning 50 has really messed with my memory. My doctor might have something to help me clarify my memories a lot better, but until then I’ll have to hope that you know the program that I mean. Anyway, thanks for…Oh! I think I remember now. It’s called “ScreenSteps, The Next Generation”, isn’t it? Wow, just thinking about you helped to clarify that for me! Thanks so much for all that you and Steve do by putting out the NosillaCast. You guys give so much of your time, your thoughts, your efforts and of yourselves in so many ways. Not to mention how you’re giving up your “retirement” years. I’m sure you know you’re appreciated but I have to say it again: THANKS FOR ALL THAT YOU DO! Again, congratulations on NosillaCast #500! You guys don’t look a day over 100! P.S. The last time I sent in some audio for you guys I said that I’d have to cut down on how long I took between submissions. My last one was four years since the previous submission. This one only took two years. See, I’m getting better. That’s a 50 percent improvement, just to clarify that for you. This week I had two appearances on other shows that were a bit unusual. Tuesday morning I was puttering away when I got an email from Jason Howell of TWiT asking me if I could be on MacBreak Weekly, like, well, NOW? Luckily I had a nice shirt on and I had just lit a fire in the fireplace (the temps had sunk into the low 60s) so I said yes, give me 5 and I’m there! Turns out Leo had the flu, Alex was unavailable, Rene was on vacation, so it was Andy Ihnatko holding down the fort with Serenity Caldwell from iMore.com and Mike Elgan as the host. They really like to have four people for a real panel so I got drafted and had a blast. I know Leo is an acquired taste, and I do like him on a lot of shows but on MacBreak Weekly it’s REALLY hard to get a word in edgewise. Mike Elgan isn’t the entertainer of the year, but he throws the ball to the guests so I actually got to contribute! I embedded the video on podfeet.com, if you want to jump to where they got me on, it’s about 22 minutes in! I’m amazed at your memory, Donald, you remember the year but even what TIME it was? I definitely remember the Bias booth and discussing if we should lay down some cold hard cash for some audio plugins! So glad we had that chance circumstance meeting too! This is Terry Austin from IntelligentElectrons.com I’d like to take a moment to offer my congratulations to Allison and Steve as they reach this new milestone, the 500th episode of the Nosillacast. Thank you for all you do for the Mac community. Personally, I switched to Mac in 2009 and have never looked back. I discovered the Nosillacast early on and with guidance from Allison and the Castaways felt right at home with my new Mac. I was fortunate enough during Macworld 2013 to get to meet Allison, Steve and many of my fellow NosillaCastaways at the Castaway Party. Once again, you all made me feel right at home. I could wax poetic about all of the awesome things I’ve learned over the years, instead I’ll just say that Allison and everyone associated with the Nosillacast embody the best of what makes the Mac community so very special. Thanks for the first 500. I look forward to all that is yet to come. If you’ve ever gotten an email from me in the last couple of years, you’ll notice I have a cute little drawing of the podfeet in my signature – those were drawn by Terry during a session at Macworld! Thanks Terry! Thank you, Todd! One of the best investments we’ve ever made was in throwing the NosillaCastaways party at Macworld. So many new friends. Remember, we get to go to Chicago on June 20th 2015 for the next Mac party at Barry’s house! Ok, back to some tech stories for a bit. The next appearance wasn’t a surprise, but it turned into even more of an emergency. Tom Merrit and his producer Jennie Josephson had asked me WAY in advance if I could be on the Daily Tech News Show on Wednesday at 1:15pm. At around 11:30am, Steve and I were puttering on our computers when we saw the lights dim and then our computer speakers started making really loud noises. I unplugged my Mac from my monitor that gives it power immediately. We both ran into the spare room to shut down the Drobos, one of which was on a UPS, the other just on a surge protector. I knew I had to get ready to be on Tom’s show, so I decided I’d just go downstairs to make lunch while the power settled out. When I turned on the overhead fluorescent lights, they came on REALLY REALLY bright. I mean REALLY bright. Then they started making a crackling noise. We noticed the refrigerator was making weird noises too. On the other side of the house though the lights were really wimpy. We have lights up our bannister with a garland and they were really dim and sort of pulsing as though they could barely keep up. Steve went back upstairs and yelled to me that he smelled smoke. I dashed up after him (in retrospect I PROBABLY should have brought one of the three fire extinguishers we have in the house) to find the entire upstairs smelling of burned electronics. I have a pretty good nose, but for the life of me I could not isolate which room had something burning. As we later figured out, it was because many of the rooms had things burning. Every single surge protector upstairs was burned out, and there was a concerning black mark on the power cord from our Airport Extreme. I think it’s important to point out that during ALL of this our $150 each Nest Smoke Detectors were quiet as church mice. That’s when Steve, the trusty Electrical Engineer whipped out his voltmeter and started some measurements. In the US, a normal outlet should show 120 Volts AC and we have two lines coming into our house. When he checked the kitchen, he discovered it was at 200VAC!!! Now that explained the other room being weak, as it was reading at 40VAC. Get it? 200 + 40 = 240, instead of 120 + 120. So this was a BAD thing. Steve killed the breakers for most of the house as it was clear this was getting to be a really dangerous situation. At this point it was pretty clear to me that I was not going to make my schedule of 1:15 to be on the air with Tom, so I called my good friends Bill and Diane and asked them if I could come over and borrow a cup of Internet. I raced down there, commandeered their den, hard wired 100mbps Internet, stole a monitor and I was in business. Tom was pretty happy that I’d made it work, and we had a great time. By the way, we had a great conversation about the new Google Captcha program. They’ve implemented a new idea that is supposed to be able to tell you’re a human without you having to decipher one of those annoying squiggly letter thingys. We talked about how this will work for the blind and those with motor control disabilities too. I posted the link to Daily Tech News Show #2378 in the shownotes so you can see it now. I didn’t want to go home to the house of terror but Steve was stuck there all alone with Tesla in the dark so I figured I’d better go. After a cup of tea of course. We kept the power off till around 8:30 when Steve thought it would be fun to do a site survey to find out how many houses were in the dark from this situation. We had heard from a neighbor that 19 homes were affected. When we were on the block behind our house, we saw a Southern California Edison truck and two guys carrying a ladder coming back from behind our house. We cornered them, explained we were engineers so we wanted to know exactly what happened. They had just finished the repair and said it was a separated neutral at the transformer which caused the two power phases to split into a 200 and 40 VAC rather than the usual 120 and 120 VAC. They told us that if we had any damage, we’d have to file a claim with SCE. We went home and flipped the breakers back on to find out the damage. Like I said earlier the surge protectors were burned out, but the good news is that every single thing that was on a surge protector survived! Even the black mark on the Airport Extreme cord was just from the surge protector itself. The older UPS for one of the Drobos also burned up, but both Drobos were ok. Whew! Steve had his iMac on a UPS too, and it was fine. Downstairs in the room of 40Volts, everything was fine but the other side was not so lucky. The electric garage door opener died, all of the ballasts for the fluorescent lights were burned out and we lost the microwave oven. You might not think that’s such a big deal, you can get one for $40, but ours was built into a wall oven, and they don’t make just the microwave, nor can the replace the microwave, we had to buy a whole new oven. We REALLY hope SCE pays off on our claim! I told you this story to make you happy that even your cheap little surge protectors might just save your electronics, and to think about those devices (especially expensive ones) that might not be on surge protectors yet. I can tell you that when the new microwave goes in, we’re definitely putting a surge protector on it! Let’s take a break before our next set of contributions to talk about our newest sponsor, Hover. Remember how I said I was going to move my domains this week? Between the power outtage and some other commitments I didn’t do it yet, but I PROMISE I’ll do it next week! I was worried about one aspect – what if I have time left on my domain registration with the old company, how does that work? It turns out you basically buy a one year extension and don’t worry about it. You never lose the time you already paid for with your previous company so you can move when YOU want to move. When you have a great idea, even if you’re not ready to pull the trigger on it, buy a domain name right away before it’s taken. If you go to Hover.com for your domain, you’ll be in and out in just a couple of minutes because their interface is clean and uncluttered, their explanations are concise and there’s NO upsell at all. You pick out a name, you get free WHOIS privacy (that’s so people can’t look up your home address), and boom, you’re done. If you’re new to Hover, you can get 10% off every domain you register with them this month by using coupon code XXXXXXX. If you forget the code, it’s embedded in the Hover badge on podfeet.com right now in the right sidebar! By the way I’ve gotten feedback from a bunch of you about how much you already love Hover! Even Bart likes them! I chose the order of the next four contributions on purpose. Hello Nosillacastaways, Wingman Steve and oh yes Allison. Any time you do something for the Nosillacast we have to start with a problem to be solved. That problem is how best to congratulate and thank Allison for reaching such a major milestone in podcasting and as well as all she has done to build an amazing community. The best place to start is to begin with how warm and welcoming Allison is to new people who wander in. Just like she was to me back in March of 2009 when I joined the live show for the first time. I was attracted to the show because I loved the way Allison delivered the content, She does it in a way that is both entertaining and informative all at the same time. The content speaks to the uber geek and the technology newbie all at once. Let’s also not forget the sense of community that both she and Steve foster for the group lovingly referred to as the Nosillacastaways, Thanks Rose for coining that term. I think that has meant the most to me is the friendships I have formed through being involved in the community. Not the least of which are Allison and my ever present Wingman Steve. They have shared more kindness than I could have ever imagined. Not only being a friend to me but my family as well. I can’t forget all the friends I have made by association with the show not to mention without her encouragement I would have never been brave enough to jump in and begin podcasting myself. I met my longtime partners in crime for our show Mark Greentree and Mike McPeek because of the Nosillacast. I have met so many other amazing People from all over the world that I now count among my friends I would try to name them all but I fear I would forget someone and that would not be good. Even the poor and oft maleigned Switcher Mark despite what Allison may say is truly amazing guy. Well I think I have rambled on long enough, just in closing let me say a huge congratulations to one of the most amazing, kind and caring people I know Allison, it is huge accomplishment to get to 500 shows and I look forward to the next 500 shows. Continue on with your ever so slight Macintosh bias and we will continue to enjoy all that you do for us. This is Steve’s Wingman aka Big_in_va signing off. I love having Mike and Kevin’s stories together because they do interweave so perfectly. Neither of them mention the show they have with Mark Greentree, because they’re awful at marketing their show, so I’ll do it for them. It’s called The Geekiest Show Ever at geekiestshowever.wordpress.com, go check it out. Thank you gentlemen and I’m so glad we found each other. I’m again astonished that Kevin can remember exactly when he got into the live chat room for the first time. Kevin is really the center of the live show, on the rare occasion when he can’t come, it’s not the same. By the way, if you remember the great Mipples kidnapping incident, Kevin was the one behind those shenanigans! Since Kevin mentioned the “much maligned” Switcher Mark, I guess I’m forced to play the recording Mark sent in too. The penultimate contribution is very unusual in a few ways. John Bachman sent in this contribution. I said at the beginning that the contributor represented every type of NosillaCastaways from the silly to the sincere. John then represents the silent masses, those of you who haven’t sent anything in before but are nonetheless loyal listeners. He’s also done his contribution as a musical tribute. Not that Professor Albert wasn’t musical of course… anyway, here’s John Bachman’s wonderful contribution. Even though I’m not a regular listener to music, Elvis Costello’s song Allison was one of my favorites as a young child, so this brought back great memories, John. I can’t believe your FIRST contribution is this cool. Thank you so much. All of these contributions warm my heart. We never knew when we started this journey together that the community would spring out of nothing, that Rose would name it the NosillaCastaways and that we would become such good friends. If you haven’t been to the live show yet, I think you got a tiny bit of flavor for why it’s not really about me creating a show, it’s about the lifelong friends you will make in the chatroom. But I think most of all I’m happy that so many people mentioned Steve in their congratulations. I started this alone and figured it was my gig that I’d have to squeeze into our lives, but instead, Steve is the one who made it exist. He makes dinner on Sunday nights, he brings me a beer, he reminds me to brush my hair, he turns on my LED light panel (that he bought me) along with the back lighting, he flips my podfeet pin over so it’s visible hanging on the microphone and boom arm that he bought me, he takes the collar off of Tesla, he takes the phone out of the room, and he moderates the chat room to ensure that Switcher Mark doesn’t shoot too many spitballs at me…and that’s JUST for the live show! There are endless more things he does to make our videos from trade shows and to keep our life on track while I dedicate my brain to making fresh content for you. I absolutely had no idea he would become such a big part of the show and I thank him from the bottom of my heart. I don’t like to let him get a word in edgewise, but he did send in our final contribution. Hi Allison, this is husband Steve. I’d like to congratulate you on completing 500 NosillaCast episodes, what an accomplishment! When you began your podcast adventure back on May 13, 2005, neither of us had any idea where it would take us. Since then you’ve produced a podcast every week like clockwork for over 9-½ years. That’s a rare feat in the podcasting community and one of which you can be proud. Throughout this period the NosillaCast community has grown up around you providing their support, content for your show and a lot of good times. To commemorate the event, I wanted to capture how your show has evolved over the years but I wasn’t quite sure how to do it. Then during our recent visit with Slau in New York, he mentioned something that caught my ear. He noted how you’ve delivered the word “ever” in your tag line “A technology geek podcast with an EVER so slight Macintosh bias” with more and more emphasis over time. So I went back to the first NosillaCast podcast and started listening to the introduction of your earlier and some of your later shows … and you know, Slau was right. So I made an audio compilation of your introductions noting this and some of the other changes your introduction underwent over time. The first three clips I selected are excerpts of your show’s introduction, starting with the first NosillaCast in May 2005 followed by episodes from July and October of 2005. The next three clips show how you fine tuned your tag line and first added the Midnight Dialogue opening music to your introduction. The last clip in March 2006 was the first time you used your now well known tag line in its final form. From the time you firmed up your tag line in March 2006, it took about a year for you to get the punch on the word “Ever!” as we know it today. The next three clips show how your emphasis on the word “Ever!” evolved from March 2006 to March 2007. I have to say, Slau was right on. One of the ways you were able to produce a show every week for 500 episodes was through the help of three good friends who filled in for you when you were on vacation or otherwise disposed. They all had their unique style for saying your tag line during the show’s introduction. The next three clips are from Katie Floyd, Allister Jenks and Bart Busschots doing their part to keep the NosillaCast going strong. You know, Bart’s emphasis on the word Ever makes me chuckle every time. Of course, your show has evolved in many ways other than your introduction, including adding listener contributions and reviews, Dumb Question Corner, Chit Chat Across the Pond, the live show with the NosillaCast chatroom, the iOS NosillaCast app designed by Donald Burr and a handful of sponsors. But looking back, I think the most significant development over these nearly-10-years is the new set of friends we’ve come to know because of your podcast. You and I consider many of these friends as close even though we haven’t met in real life. We’ve also travelled across the U.S., the Atlantic and the Pacific to meet some of these friends. I know you’ve thoroughly enjoyed each one of these NosillaCast meet-ups as much as I have … and I also know you look forward to many more meet-ups wherever they may take us. I’m so pleased you started and stayed with the NosillaCast, for without it just think of friendships we’d be missing. So again Allison, congratulations on achieving 500 wonderful episodes of the NosillaCast. I’m extremely proud of what you’ve accomplished and I’m very happy to see the NosillaCastAways evolve into THE thriving community that surrounds us today. That’s it for now … and you can rest assured that I will stay subscribed. Wow. I’m overwhelmed everyone. This has been an amazing journey. I want to thank all of YOU. Those of you who contribute in amazing and huge ways like Bart, to Allister and Katie who fill in for me while I’m gone, to all of those who’ve been guests on the show (even Guy) and those of you who have done listener contributions and also to those of you who quietly download and listen. And most of all, to Steve for being the one who encourages me the most to get out there and make it happen. By the way, I was tempted to pretend that I was going to quit at 500 episodes, but I’m just not that mean, no matter what SwitcherMark has to say. I’m a big fan of the IRC client Textual from codeux.com/textual to chat in the live chat room each week, so when they had a new version out on the Mac App Store I was more than willing to buy it. However, I have a lot of chat rooms set up in there, from my own over on Donald Burr’s server Borgchat, to Tom Merritt’s, to TWiT’s to the Mac Geek Guy’s chat server. I didn’t want to take the risk that I’d lose all of those configurations when I did the upgrade. Clarify to the rescue! I whipped it open and just took screenshot after screenshot to record each setting on each server. After just a few minutes I had them all captured. Next I indented each set so I could see visually which server I was looking for when the time came. I saved it to Evernote and I knew I had my belt and suspenders ready just in case. This is just one of a zillion uses I find for Clarify, to help ME remember things so I can save myself. If you don’t have Clarify yet (there’s a few holdouts still), then head on over to clarify-it.com and download the free trial. You can buy it in the Mac App Store or directly through them, you can buy it for Mac or Windows or even a cross-platform version. Heck, there’s bundle discounts, buy one for the whole family! When you do, be sure to tell them Allison sent you. I hope you enjoyed this virtual high five for 500 shows and will stick around for a long time with us, I’ll be sure to keep making shows, as long as you stay subscribed. thanks to the makers of Clarify over at clarify-it.com and to Hover for your domain names at hover.com. Don’t forget to send in your Dumb Questions, comments and suggestions by emailing me at allison@podfeet.com, follow me on twitter and app.net @podfeet. 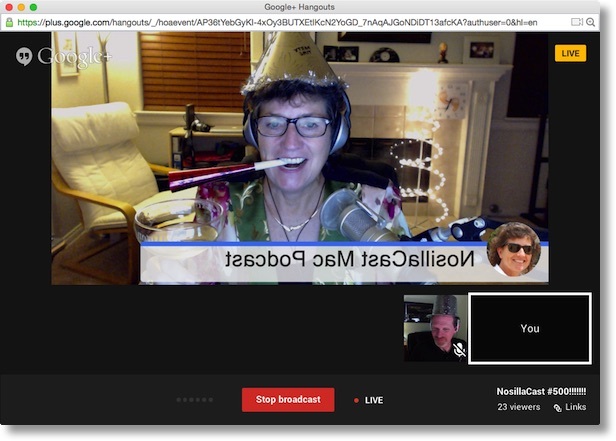 Check out the NosillaCast Google Plus Community too – lots of fun over there! If you want to join in the fun of the live show, head on over to podfeet.com/live on Sunday nights at 5pm Pacific Time and join the friendly and enthusiastic NosillaCastaways. Thanks for listening, and stay subscribed.